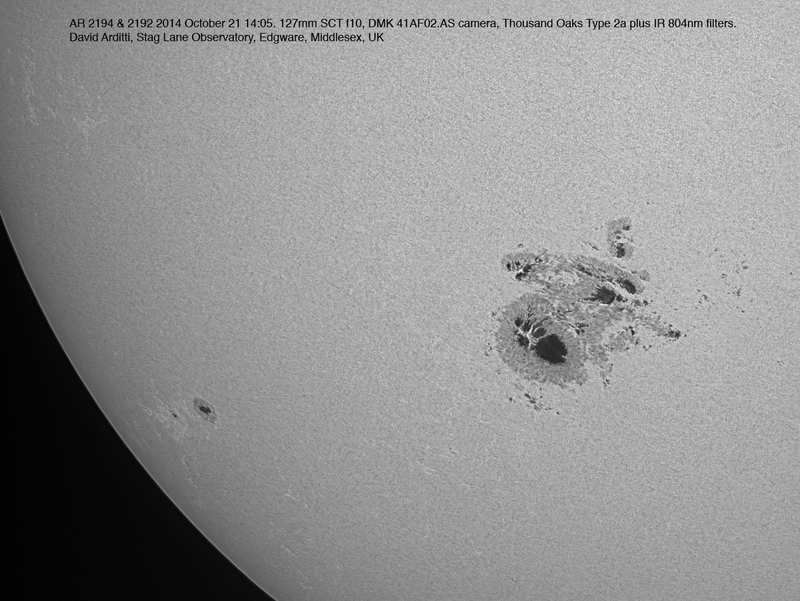 Seeing very poor today in the afternoon, but I took images of the spot in IR and H alpha, which I have put side by side here, though the quality of the H alpha image doesn’t really justify this image scale. 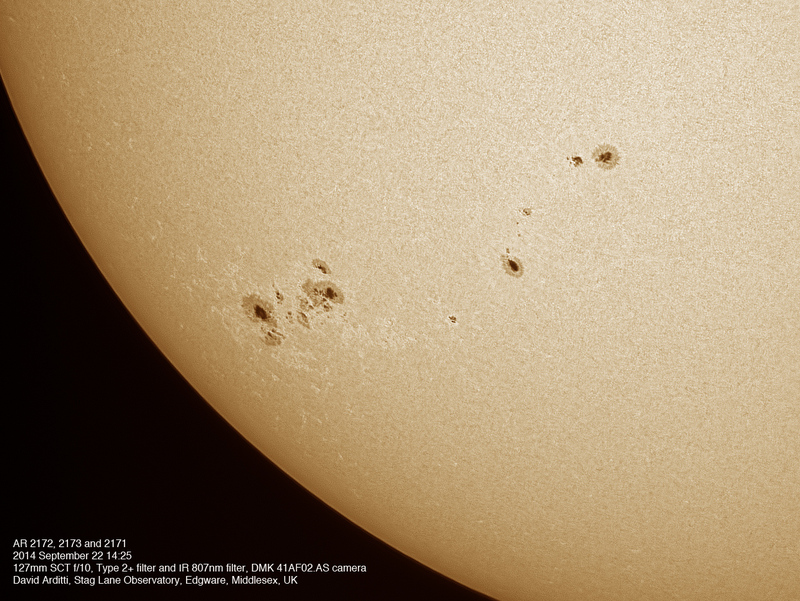 A flare was active during the H alpha capture. 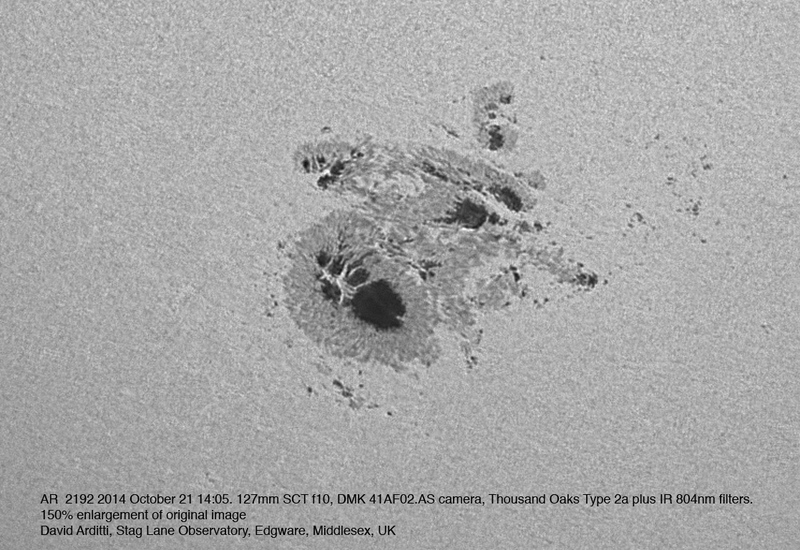 AR2192 in reasonable seeing in IR light. 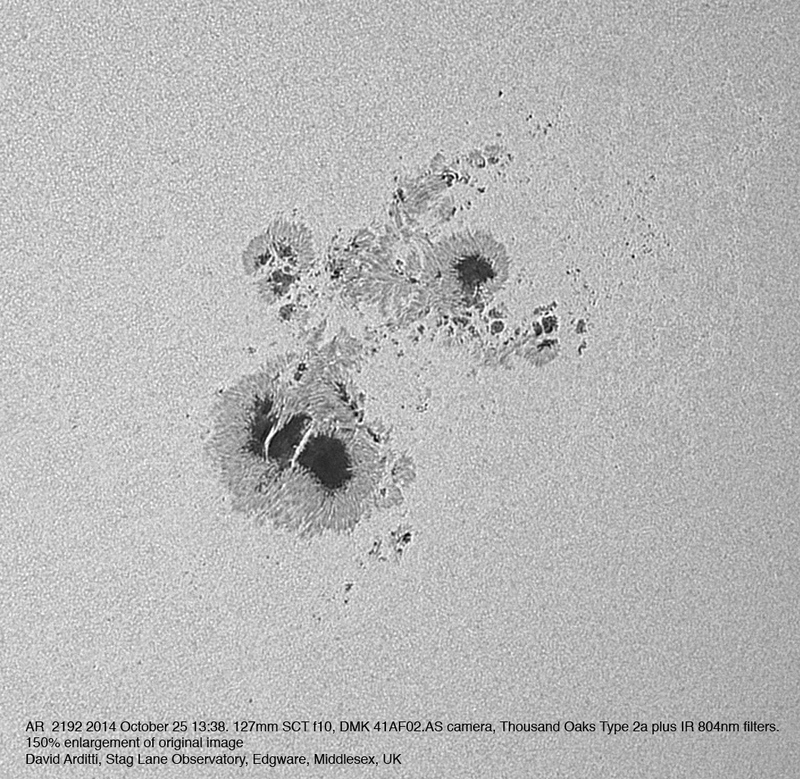 Here’s my take on the giant sunspot AR 2192. 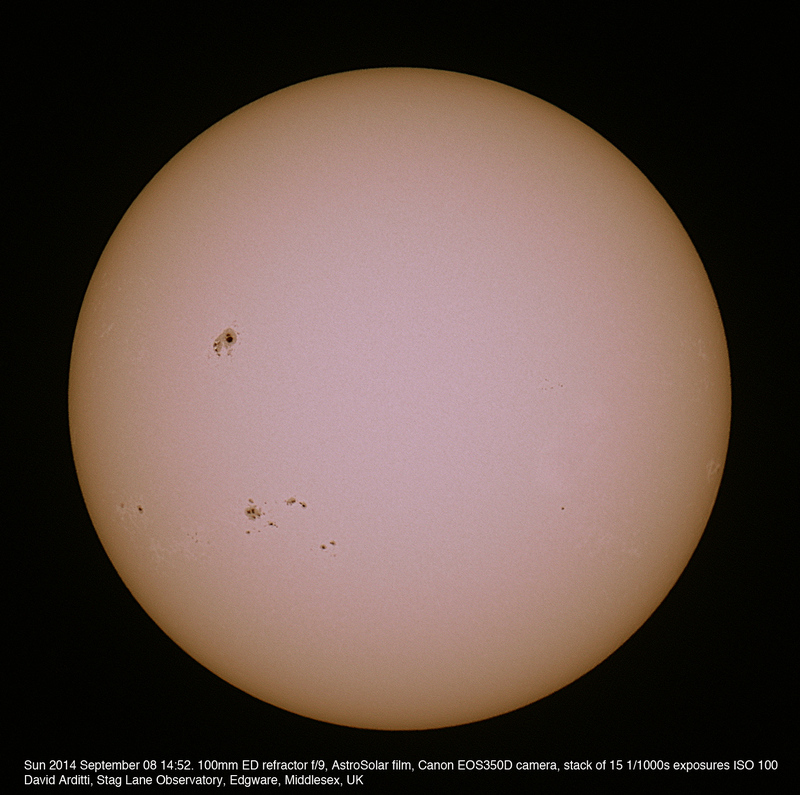 Here are some large images I produced in the process of writing an article on ‘Imaging the Sun in Narrowband’ for the December 2014 issue of Astronomy Now. 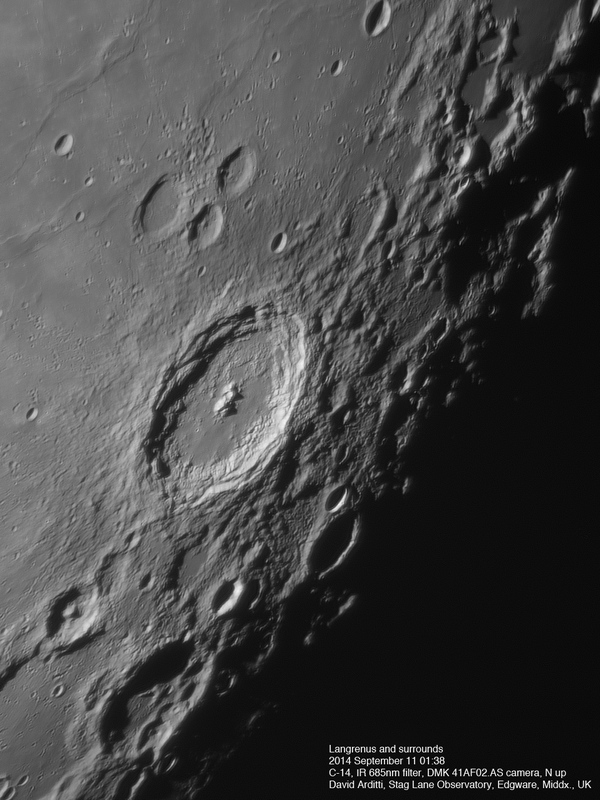 The second is a three-part mosaic with the Lunt LS60T, which gets the whole disk in. I hit on a very successful IR blocking method here. This was to use a 2″ Baader 35nm H alpha filter, that I sometimes use for deep-sky imaging, in the imaging train as a blocker. Click once or twice to get images full-size. The first won’t fit on most screens. 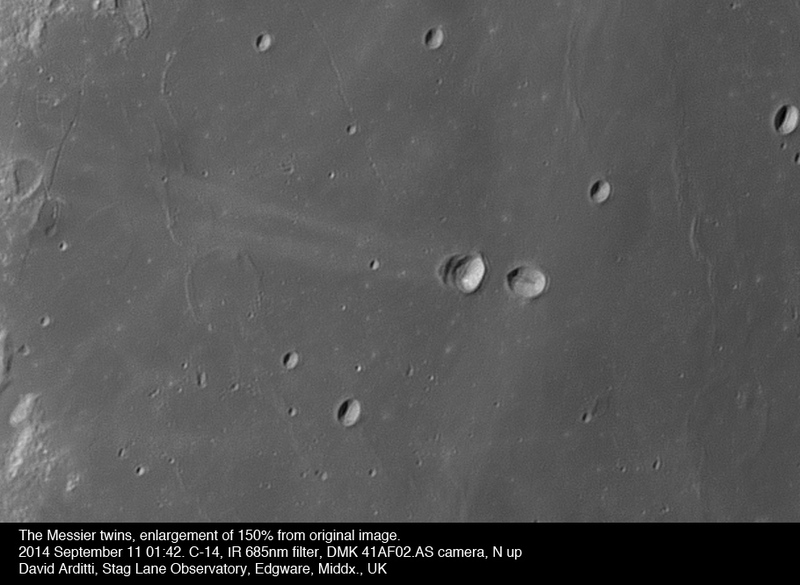 On the 9th seeing was not too good, but this image does show up some of the clefts in Hevelius and the irregular dome in Grimaldi. 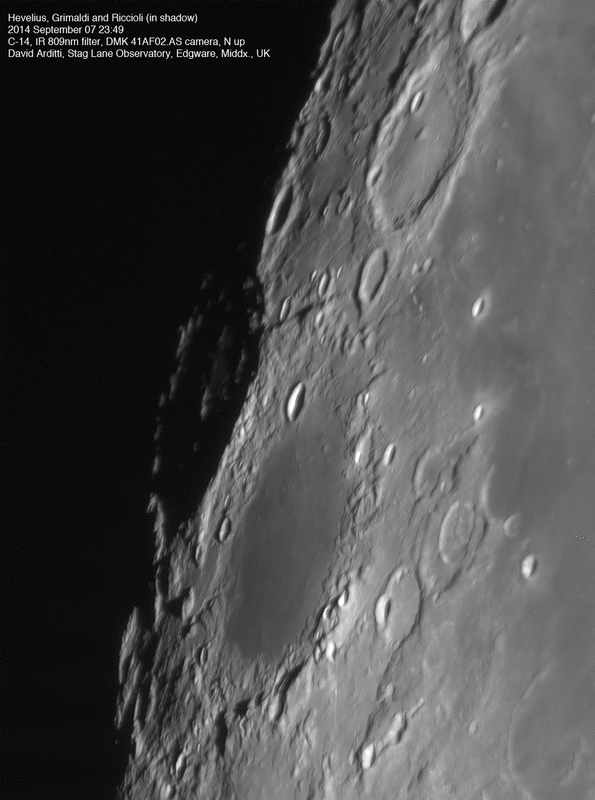 The vague gash extending from Riccioli away from the terminator is known as the ‘Miyamori Valley”. It is not really a valley at all, but a conjunction of shadows. 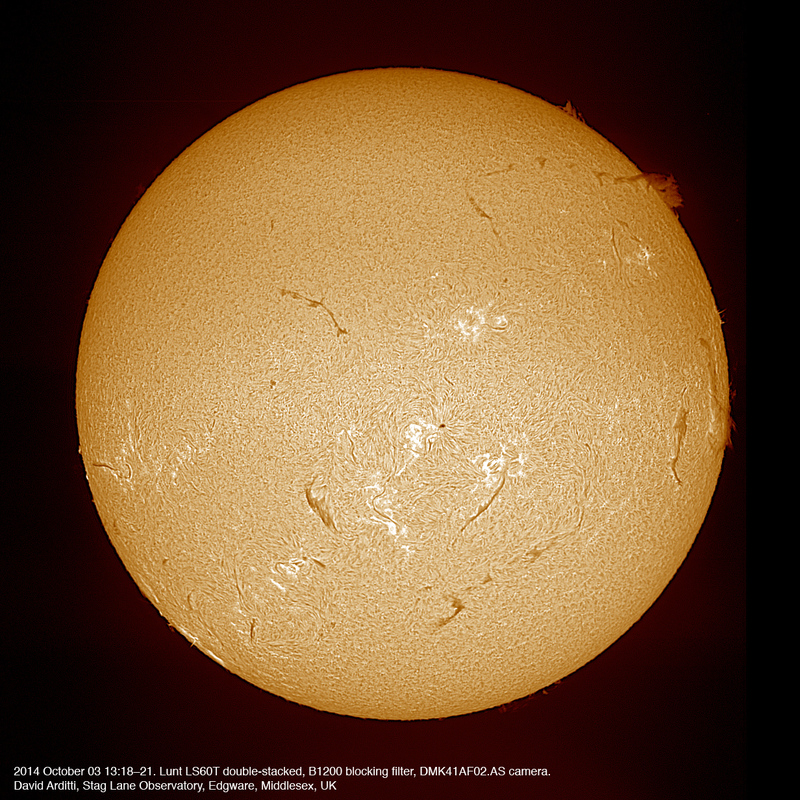 Seeing was better on the 11th and the image of the Messier twins shows their structure clearly. 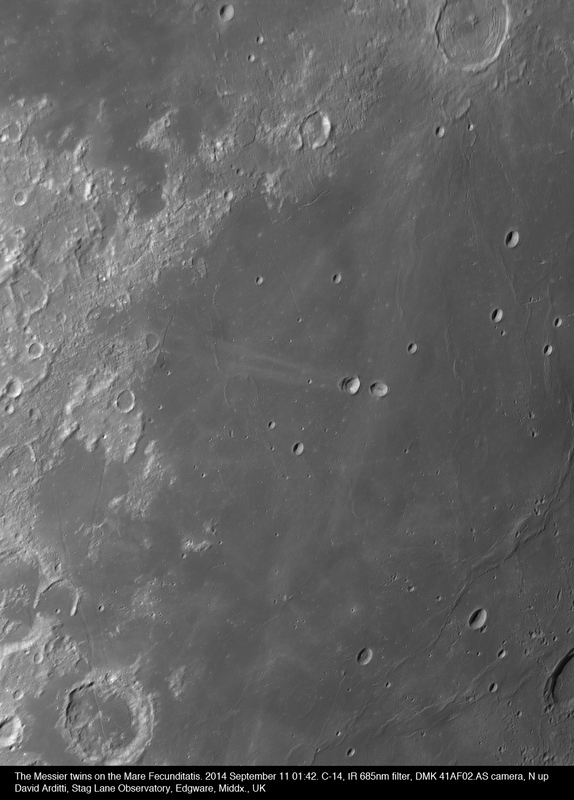 As Bill Leatherbarrow, BAA Lunar Section Director comments, the multiple west wall of Messier A is probably responsible for most of the historical anamalous observations of this pair. 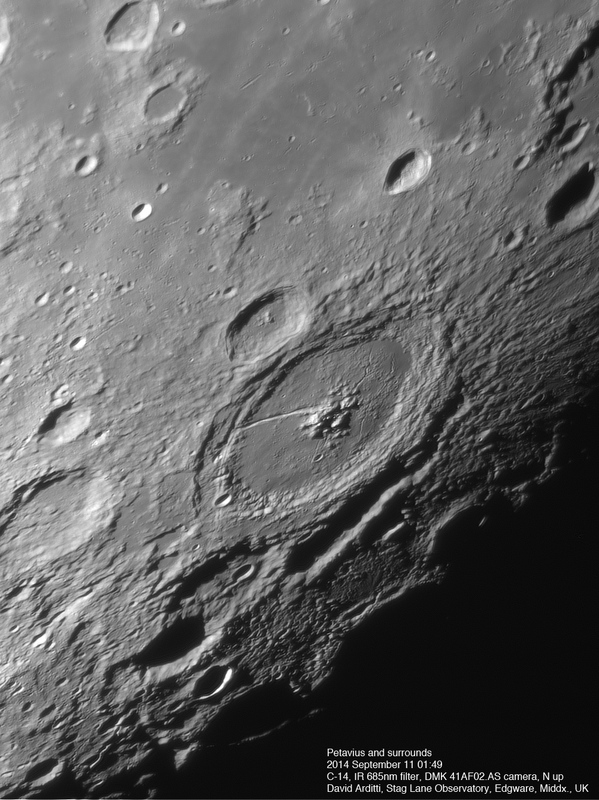 I thought I should take Jacques with a longer focal length than I used on August 05 with the Hyperstar, so I imaged it here with my 100mm f/9 refractor at prime focus with a Canon EOS 400D (as it’s inconvenient to remove the QHY8 CCD camera from the Hyperstar). A couple of things went wrong with this image. 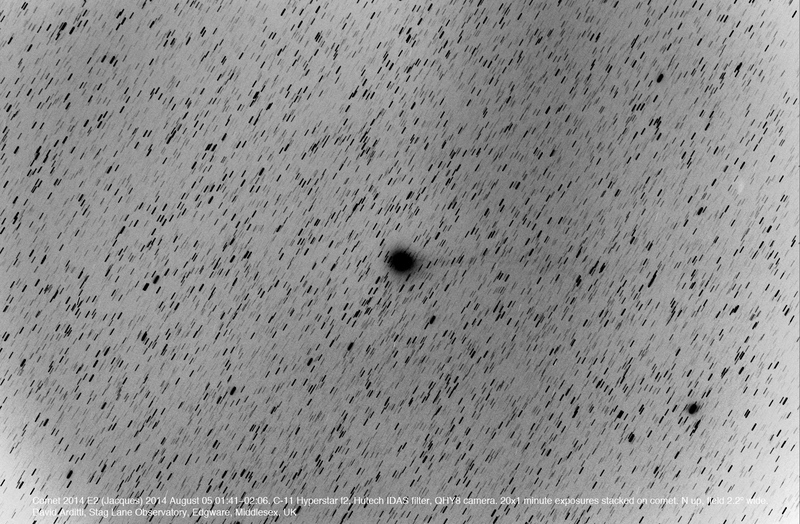 Firstly the exposure I chose was too long: there is noticeable drift of the comet in 2 minutes at this image scale, so it is not as round as it should be. Secondly, it clouded over after I had only got 6 subs. I have tried stretching the image and inverting it, as I did before, but there is no evidence of a tail here at all (though this is a much better calibrated image than the Hyperstar one). Processing was in Nebulosity 2, and Photoshop CS4 using GradientXterminator and Neat Image plug-ins. 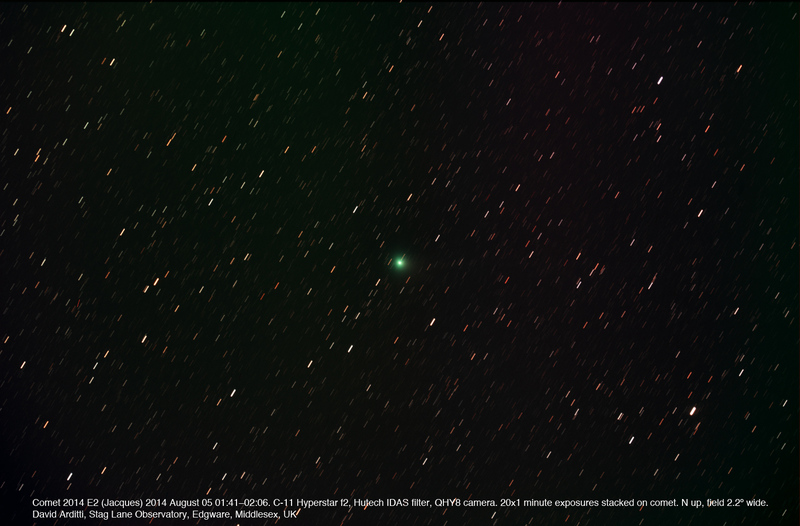 Here’s Comet Jacques from last night. 20 one minute exposures stacked on the comet. There are some colour gradients in the background that I haven’t been able to correct, I possibly need need better flat fields. No trace of a tail in this image, though people have imaged a faint tail from darker sites. 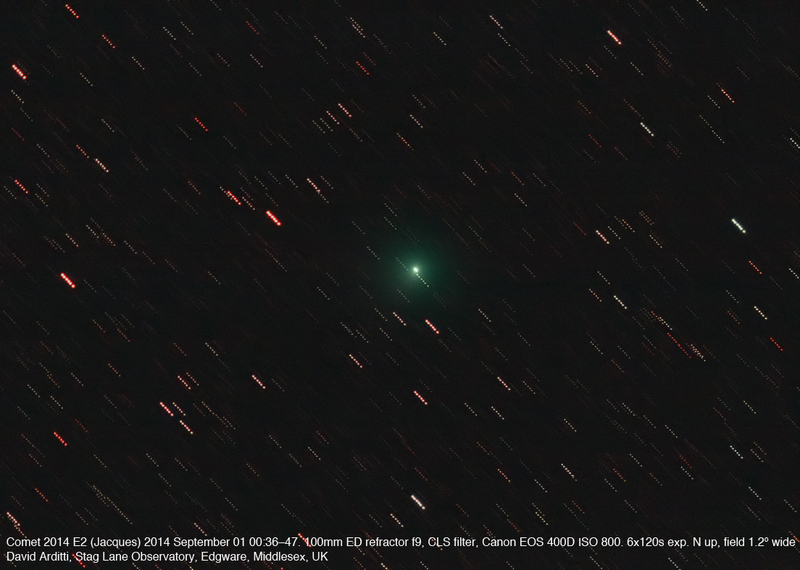 I think this is the nicest dark-sky comet we have had fore a long time, possible since Holmes. 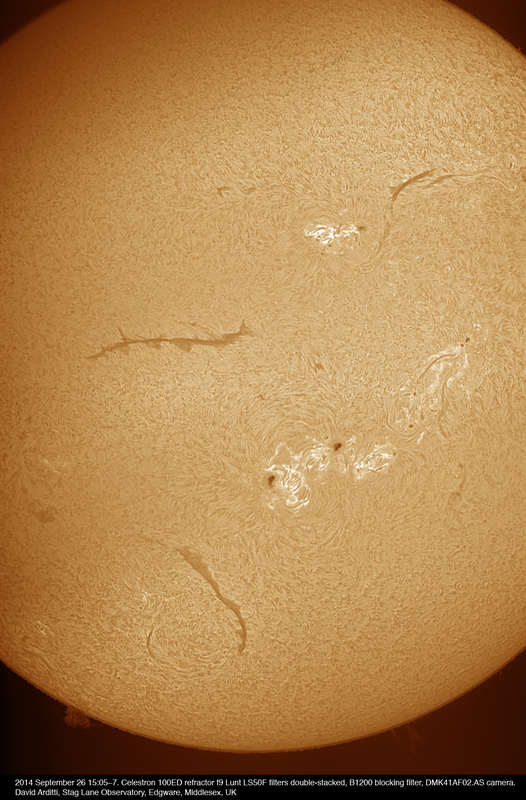 It was just visible in 10×50 binoculars, and in a 100mm refractor it was a very nice sight. On Richard Miles’ suggestion I tried radically stretching the image. I also inverted it and made it mono, and lo and behold, a tail is visible, to the right (west). 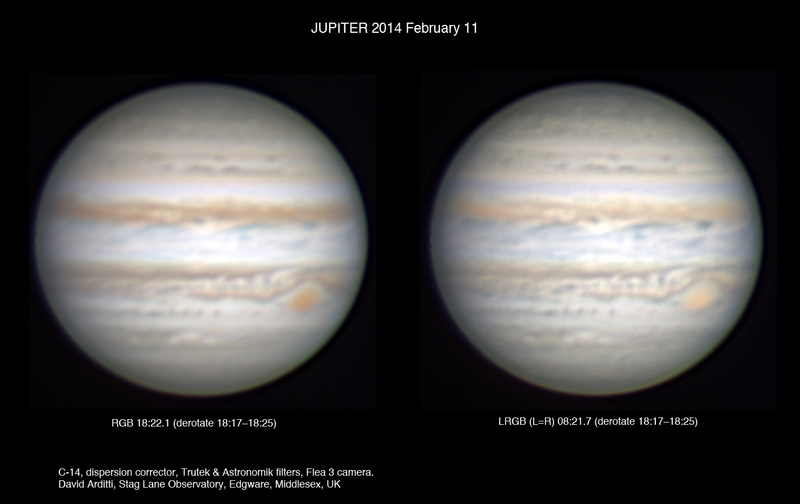 Here is the result of my Jupiter imaging early last night. Ropey seeing, but something salvaged. 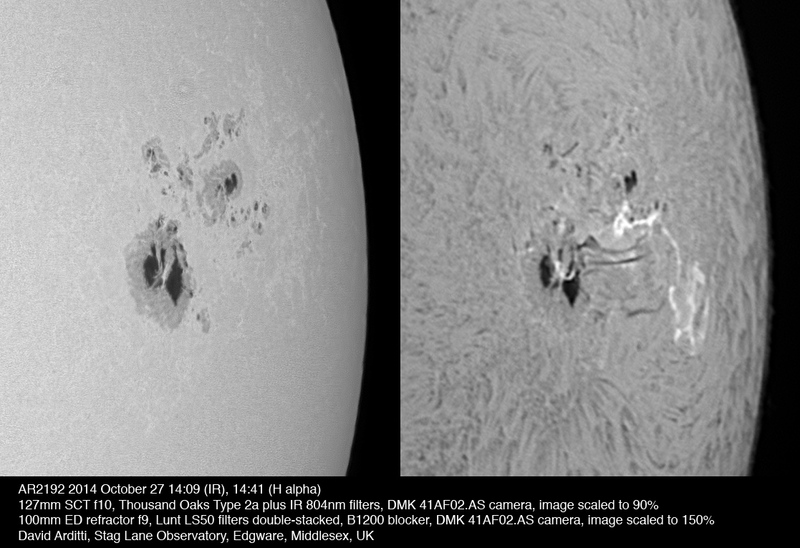 Two different presentations of the same data: the RGB shows truer colour, but the LRGB gives better contrast.